Rabbit Island is an exciting place. A giant golden carrot shimmers on the horizon! It's time to harvest the carrots, but unfortunately the rabbits can't swim. So they sink big stones in the water and build a bridge with boards. 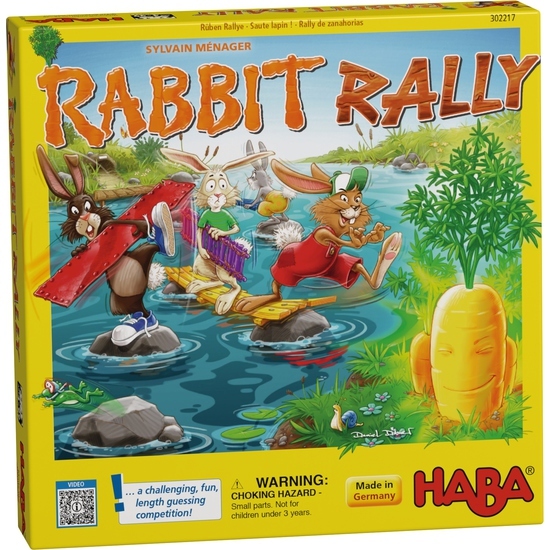 But be careful - a player who overestimates the length of the boards must stand still and watch the other rabbits hop past on their way to the carrot island. Contents: 4 rabbits, 3 wooden carrots, 6 bridge pieces, 5 gray stones, 1 carrot island, 1 starting island, 1 color dice, 1 set of instructions.